Its all happening ~ So Hungary head home – after a mutual show of appreciation with their fans – while Belgium motor on to a quarter-final meeting with Wales on Friday. They took just one point against Gareth Bale and co in their qualifying group but on tonight’s evidence must be considered favourites to reach the semi-final. .. .. more happening at Euro 2016 – with a picture going viral on internet. Iceland is a Nordic island country between the North Atlantic and the Arctic Ocean. It has a population of 332,529 and an area of 103,000 km2 (40,000 sq mi), making it the most sparsely populated country in Europe. The capital and largest city is Reykjavík. Reykjavík and the surrounding areas in the southwest of the country are home to over two-thirds of the population. Iceland is volcanically and geologically active. According to Landnámabók, the settlement of Iceland began in the year 874 AD when the Norwegian chieftain Ingólfr Arnarson became the first permanent settler on the island. In 1994, it became a part of the European Economic Area, which supported diversification into economic and financial services. In 2013, it was ranked as the 13th most-developed country in the world by the United Nations' Human Development Index.. .. they are making news in Euro 2016. Icelandic football commentator Gudmundur Benediktsson has gone from the high of delivering one of the most memorable passages of commentary at Euro 2016 to the low of losing his day job within four days. Benediktsson’s commentary as Iceland secured a last minute winner against Austria went viral as he screamed then appeared to suffer an emotional breakdown when Arnor Ingvi Traustason scored a barely believable goal with the last touch of the game. Iceland's unbeaten march to face England in Nice on Monday [Tuesday morning !] has been the story of Euro 2016 so far. No smaller country had ever qualified for a Euro or a World Cup. TV commentator "Gummi Ben" ascended into hysteria -- "Never, ever, have I felt as good!" -- as he narrated his team's last-minute goal against Austria that won the game 2-1. The tiny country's success seems like a miracle. Clearly the Icelanders are obsessed with soccer. England arrived in Nice on Sunday to prepare for the Euro 2016 last-16 meeting with minnows Iceland - but it has not been a journey without incident. They find themselves in the tougher half of the draw with Spain, Italy, Germany and France after finishing second in Group B behind Wales, England's fate sealed by a goalless draw against Slovakia in Saint-Etienne. England manager Roy Hodgson faced fierce scrutiny after his policy of making six changes, including resting captain Wayne Rooney, did not produce the win required to put them ahead of Wales in the standings. There could still be salvation for Hodgson, however, as England are now firm favourites to reach the quarter-finals - but the stakes are huge for manager and players. If England cannot navigate a way past Iceland and into a last-eight meeting with hosts France or the Republic of Ireland in Paris, it is impossible to see how he will survive as manager. England's future at UEFA EURO 2016 hinges on their ability to break down surprise package Iceland, a team with plenty of English league experience in their ranks. Previous meetings. England first met Iceland in a warm-up game for the 1982 FIFA World Cup, drawing 1-1 in Reykjavik. The tie will be the last round of 16 games to be played and will take place in Nice at the Allianz Riviera. 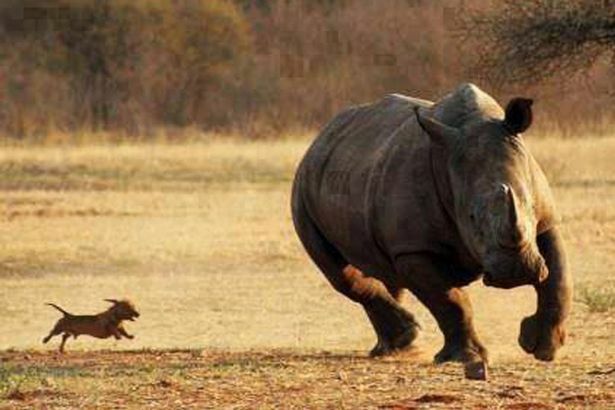 Now it is that picture of a small dog chasing a rhino that reportedly is inspiring Iceland to push for Euro glory. Media reports suggest that it has helped the smallest country ever to reach the Euros believe they can beat England in their last 16 showdown in Nice. Iceland are in the mood for another giant killing after revealing one of their dressing room secrets. They have got a picture of a small dog chasing a huge Rhino hanging on the wall of their training base in Annecy. Iceland have been using psychology with inspirational pictures and strong messages to try and inspire the players in team meetings ! Iceland midfielder Elmar Bjarnason is quoted as saying : “We have a picture of a Chihuahua chasing the Rhino. That also sticks out. Not that we are the Chihuahua! But it’s just a funny picture that sticks out. He hopes Iceland can cause a major last 16 upset in Nice against England. Bjarnason, meanwhile, grew up as a Manchester United fan and had a joke for Wayne Rooney after Cristiano Ronaldo refused to swap shirts with Iceland’s players as the Portugal star was left frustrated at failing to beat the smallest team at the tournament. “They show almost every English game on TV. I think they show every game on TV in Iceland. “So, obviously, it’s going to be a big game in my career and a lot of the boys’ career. So, it’s unreal that it’s happening now. Iceland is hoping there will be 20,000 fans to cheer us at the stadium, that .. is 20% of their population – the support sounds incredible. Will they pull off ! !